3. Other Blu-ray copy software. Crowded, nobody likes crowded. But that’s probably what you think every time you look at your DVD shelf. Days gone by, your DVD collections soon outgrew the seemingly spacious shelf. How can I add one more DVD to it? How can I keep them from being contaminated? And how do I carry them around? Many reasons call you to backup Blu-ray movies. Back-up means to make a copy of the original one, and here copy we don’t mean a hard copy but a digitalized one. We can digitalize your Blu-ray DVDs and stores them in your computer or a hard drive so you can watch them anywhere in any device you want. This time you don’t have to worry about space, contamination or inconvenience. 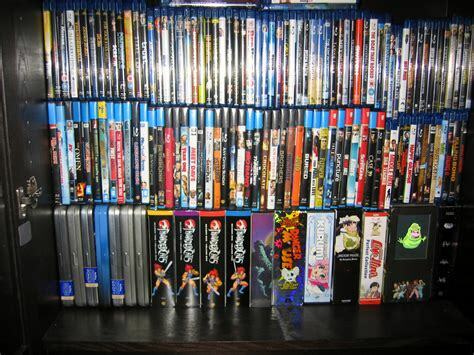 If you are looking for ways to back up your Blu-ray collections, you are in the right place. I’m going to give you a super simple solution to it. 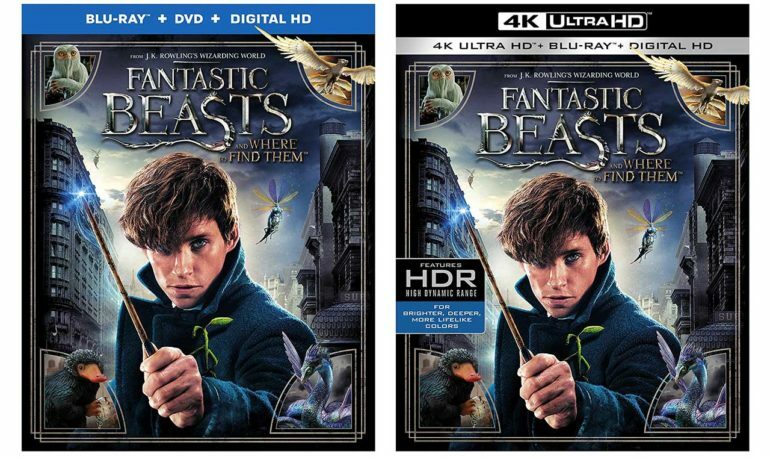 Fantastic Beasts and Where to Find Them is a 2016 fantasy film directed by David Yates. It is an extension of the wizarding world from the Harry Potter film series, and it was produced and written by J. K. Rowling in her screenwriting debut, and inspired by her 2001 book of the same name. It received positive reviews from critics and audiences, and grossed $814 million worldwide, making it the eighth highest-grossing film of 2016. So I thought I’d use this film to illustrate how to backup Blu- ray movies. To backup Blu-ray movies you need Blu-ray copy software. 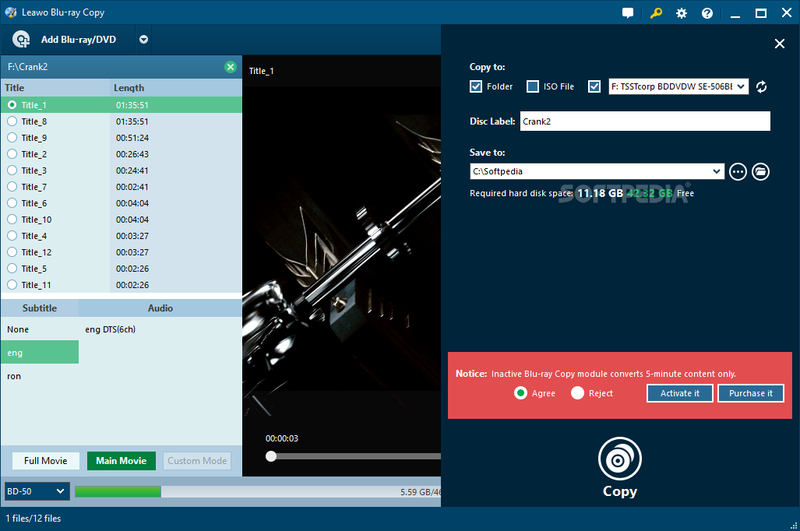 The best Blu-ray copy software I have used is Leawo Blu-ray Copy. Leawo Blu-ray Copy is the best tool to rip Blu-ray to computer with many great features to choose from. It can easily decrypt, copy and backup the latest released Blu-ray/DVD, 3D Blu-ray discs in the market, as well as the homebrew Blu-ray/DVD discs, and keep high quality. 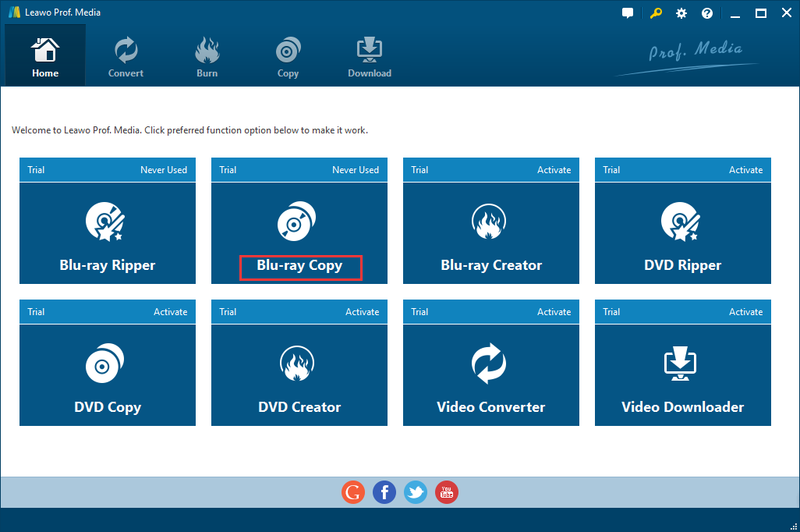 Copy Blu-ray/DVD movies disc, folder and ISO files; shrink BD50 to BD25 or DVD9 to DVD5; burn Blu-ray folder, ISO files to blank disc or hard drive in just one click. You cannot not be attracted to this software for that. * First, it has excellent copy mode. It can copy any Blu-ray/DVD Movies at 100% quality lossless. Avoid possible data loss caused by physical disc damage. Help Blu-ray/DVD collectors to copy Blu-ray/DVD and preserve valuable data in case of accidents. It can also burn Blu-ray folder/ISO file to disc with no quality loss. Duplicate Blu-ray/DVD content and saves every precious moment. * Next, it can rip/copy blu-ray to computer at 6x faster speed. It uses NVIDIA CUDA, Intel Quick System and AMD APP graphic card acceleration technologies to lower system resource occupation and lessen hardware burden. Therefore helps Copy and backup Blu-ray/DVD movies at a high speed. Full Movie – Copy the whole content as well as all the subtitles and audio tracks. Main Movie – Select the main part of the movie loaded with main subtitle and audio track for copying. Custom Mode – Free to choose any part of the movie as well as subtitles and audio tracks at will for copying. Burn ISO/Folder – Burn Blu-ray/DVD ISO image files or folder to Blu-ray/DVD Disc. * Finally, it has powerful additional functions. It is very easy in operation but powerful in function, this Blu-ray Copy makes Blu-ray/DVD discs copying easy to process. It offers new users an intuitive and simple operating procedure and layout. For experienced users, it provides multiple customized functions to fulfill their need of Blu-ray copy such as 3D effect, retain subtitles and audio tracks. 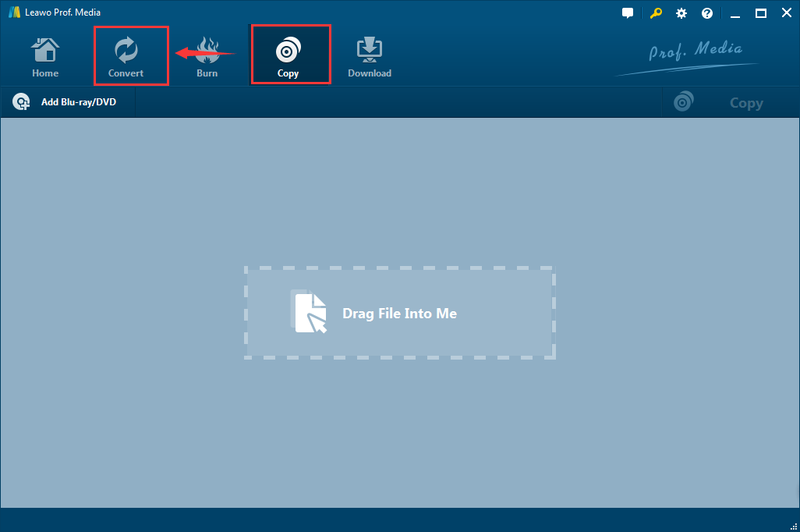 Step 1: Download Leawo Blu-ray Copy, install and kick off the program to enter the home page as shown below. Step 2: Introduce source video. You have two options to introduce source videos. Under Home button, you will see a drop down boxes that says Add Blu-ray/DVD, click it then you will see three options: you can add from CD-ROM video; add from folder or add from ISO file. The second and the simplest way are to drag file directly into the program. Since you are new in this, your only option is to add file from CD-ROM. Step 3: Chose mode. After you introduced your source video, you will see an interface like this. You can choose Full Movie, Main Movie or Common Mode for copy. Step 4: Saving settings. Click the big green Copy button on the top right, then you can choose folders to save your copy. Step 6: If you want to edit your video afterwards, you can open Leawo Blu-ray Copy again, but this time not on the copy page, click the big convert button next to it to enter a new page. After you import the copied video, you can see a small film “icon” on the right side of the movie. Click it to enter the editing interface. There are all many great features for you to DIY such as add a water mark or special effect, clip part of it, turn it into 3D or remove noise. Leawo can do all the magic. Remember to click okay to apply your settings. And then click the bog green convert button to save your homemade Blu-ray movie. Free Blu-ray copy software is professional in copying and cloning Blu-ray movie program which enables Blu-ray fans to copy and clone almost popular Blu-ray disc/folder to Blu-ray disc or ISO files. 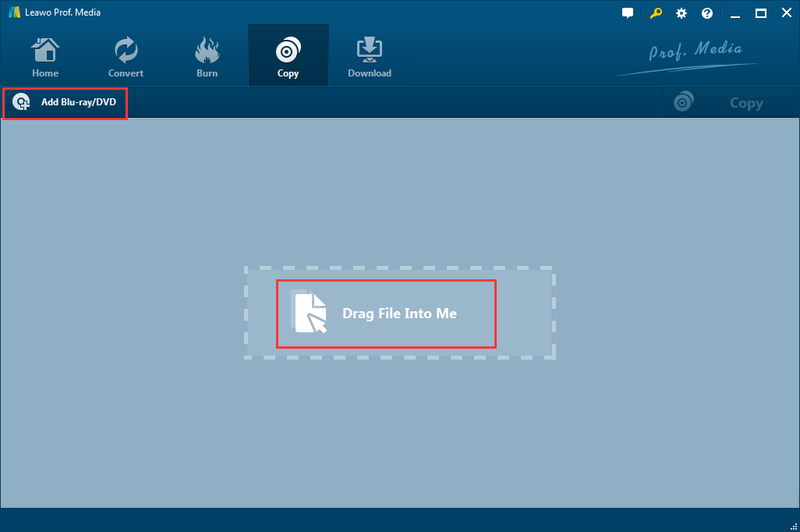 It also allows users to clone and copy full Blu-ray disc or main part of Blu-ray movie. And it can even copy and clone 3D Blu ray movies to Blu-ray Disc and ISO image files with perfect output Blu-ray video quality. BurnAware is a family of full-featured and free burning software to create CD, DVD and Blu-ray discs of all types. Home users can easily burn bootable discs, multi session discs, high-quality audio CDs and video DVDs, make, copy and burn disc images. Power users will benefit from BurnAware’s advanced options, including control of boot settings, UDF partition and versions, ISO levels and restrictions, session selection, CD text for tracks and discs, data recovering, disc spanning and direct copying. 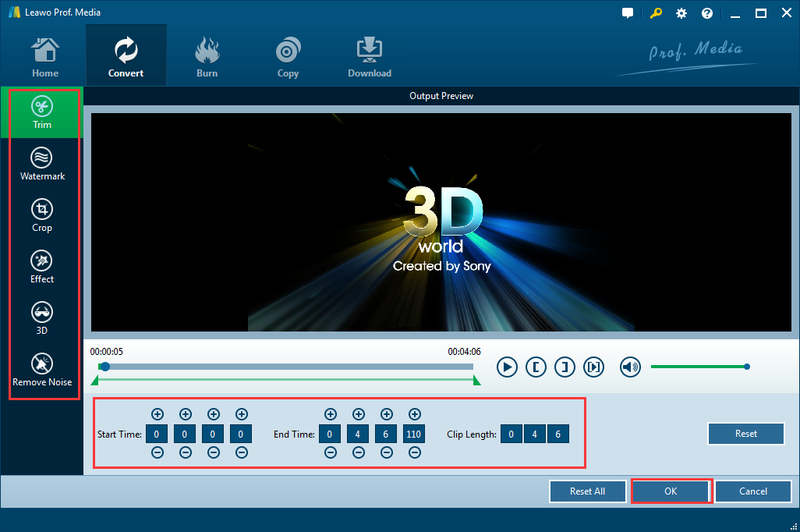 Moreover, if you are planning to backup 3D Blu ray disc, sure, it can be easily done by following the guide linked.